Democrats in California and Vermont said they wanted single-payer health care. However, they have been unable to get a majority of lawmakers to pass the massive tax hikes needed to finance single-payer. This legislation is sponsored by the Democrats’ candidate for lieutenant governor, State Rep. Peggy Flanagan, Democratic State Senate Leader Tom Bakk, congressional candidate State Rep. Ilhan Omar, and thirty-seven other Democratic lawmakers. The Democrats’ legislation says that regional health boards would select eight members of the new Minnesota Health Board. The first eight members selected by regional health boards would then appoint seven additional members who would have to be members of specified health care interest groups. These 15 appointees would never be accountable to the voters at a ballot box. They would have control over life and death decisions for every Minnesotan. In that American tradition, the Minnesota Constitution gives the power of taxation to an elected Legislature. It further requires that this “power of taxation shall never be surrendered, suspended or contracted away.” It is democratic to never let the elected Legislature surrender its power of taxation to an unelected Minnesota Health Board. Putting the unlimited power of taxation into the hands of government officials who are selected instead of elected is a gross violation of the Minnesota Constitution and the basic idea of representative democracy. 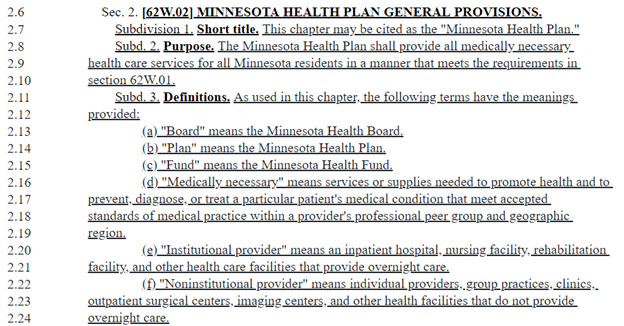 Why do Minnesota Democrats want to give the power to tax and spend to the appointed members of the Minnesota Health Board? This quote is a scary declaration of support for rule by unelected authorities instead of the elected Legislature and governor. These single-payer supporters openly express their opposition to the democratic process in other countries because they do not like the policy choices made by those countries’ elected representatives. The advocates of the Minnesota Health Plan want to take away your current health insurance and replace it with the health insurance the unelected government board decides you will have. They even want to take away your right to vote for the people who will make these decisions. The single-payer Minnesota Health Plan puts health care decisions in the hands of people who are never accountable to the people at the ballot box. That is a terrible way to run a government. We should preserve government by the people, of the people, and for the people by opposing the undemocratic single-payer Minnesota Health Plan. John Spry is an associate professor in the department of finance at the University of St. Thomas. Follow him on Twitter at @JohnASpry. One of the first acts of both the new Minnesota Legislature and Congress should be to eliminate the possibility of the train wreck of a government shutdown. Currently, the government shuts down when government spending bills are not passed into law before the start of a new budget period. Lawmakers should authorize funding for the government to continue to function when a budget year starts without new spending bills signed into law. Government shutdowns hurt the people government is supposed to serve. During a government shutdown, we continue to pay taxes for services, buildings and monuments that we are prohibited from using. For the 2013 federal government shutdown, our government attempted to block veterans and other citizens from visiting the National World War II Memorial and the National Mall by using its resources to erect barricades. Busloads of veterans on an Honor Flight tour sidestepped the government barricades to visit the World War II Memorial. The federal government had the money to erect barricades, yet it claimed it had to prevent people from visiting this memorial and the National Mall. The government used veterans as pawns in a political game of chicken instead of using public funds efficiently to let citizens visit the World War II Memorial and National Mall. The federal government told many of its employees that they were not allowed to work during the shutdown. They did not get paid during the shutdown. After the shutdown ended, we paid $2.5 billion in compensation for days when federal workers were prohibited from working. During the 2011 Minnesota government shutdown, motorists were prevented from using roadside rest areas. Government employees blocked citizens from entering our statehouse to express their views in person to their elected representatives about the government shutdown or any other issue. Elected officials and their staffers were allowed into our statehouse while the ordinary people of Minnesota were kept out. These governmental actions designed to hurt people during shutdowns are unnecessary and avoidable. Rhode Island and Wisconsin show that shutdowns are preventable even during periods of divided government. These states successfully use automatic continuing appropriation laws to prevent shutdowns. Rhode Island has used an anti-shutdown law since 1935. Rhode Island and Wisconsin regularly pass budgets without the threat of a government shutdown. Our new Minnesota Legislature can learn from past Democratic and Republican continuing-appropriation bills that have been introduced in St. Paul and Washington in recent years. 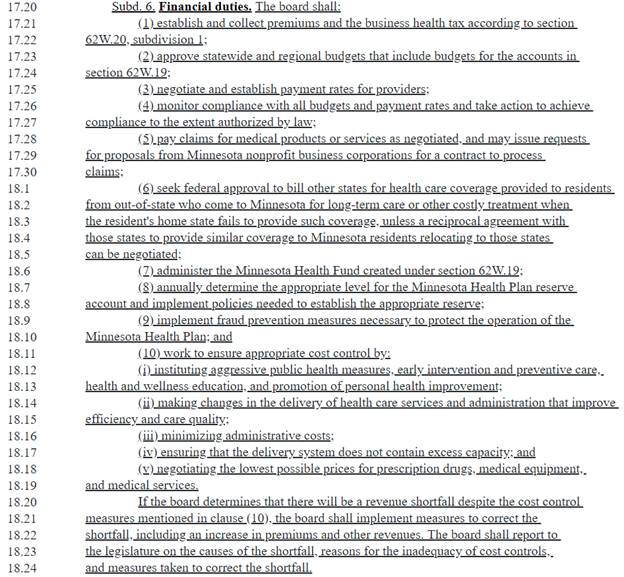 In 2013, the DFL-controlled House passed former Rep. Phyllis Khan’s (DFL-Minneapolis) bill providing for automatic continuing appropriations for one year if appropriation bills were not passed by the start of the new budget biennium. Khan noted that “Thousands of Minnesotans are hurt by any interruption in government.” She also observed that the “uncertainty of an impending shutdown and the preparations that go with it also make our state less efficient and make it more difficult for state employees to do their jobs effectively.” This good idea died in the conference committee when the DFL-controlled Senate objected to Kahn’s continuing appropriations bill. New Minnesota Senate Majority Leader Paul Gazelka (R-Nisswa) has proposed similar legislation in the past. At the federal level, Sens. Rob Portman (R-Ohio) and Jon Tester (D-Mont.) introduced the End Government Shutdowns Act to have an automatic continuing resolution continue the current level of government spending when appropriation bills are not passed by the start of a new fiscal year. Unlike bills by Rep. Kahn and Sen. Gazelka, this proposed federal legislation would reduce government funding by one percentage point after 120 days without appropriation bills being passed. Funding would be further reduced by one percentage point every 90 days until Congress passed spending bills. Minnesota will have divided government for the next two years with a DFL governor and Republican Legislature. That combination produced a 20-day government shutdown in 2011. In 2005, a Republican governor and House of Representatives and a DFL Senate produced a nine-day partial government shutdown. This time let’s do better by removing the possibility of another government shutdown. John A. Spry of St. Paul is an associate professor in the Department of Finance at the University of St. Thomas. He’s on Twitter at @JohnASpry. In 2011 I testified before the Minnesota House Tax Committee about the Economics of Taxation; Theory and Evidence for Budget Evaluation. My PowerPoint Slides are available here. Taxes are generally distortionary. That is the cost to individuals in our economy of collecting a dollar of tax revenue exceeds the tax revenue that is collected because people change their behavior in response to price changes that are caused by the tax. The marginal excess burden of raising a dollar of tax revenue is the technical term for how much extra pain is imposed on people in order to collect another dollar of tax revenue. Economic damage is a helpful, non-technical term I often used to explain the marginal excess burden of a dollar of tax revenue to non-economists. This means that the total cost of collecting a marginal dollar of additional tax revenue from slightly higher tax rates is $1.25. This includes both the dollar that is collected from people in the private sector economy and the economic damage from the distortions caused by the tax. The dollar of tax revenue is a transfer from the private sector taxpayers to the government. The extra quarter of excess burden is the cost of distorting decision-making. It is a waste to society. Instead of making decisions only for common sense reasons some decisions are changed when relative prices are changed by the tax. This behavioral response makes our economy less efficient. The benefits of public expenditures financed by taxation should be weighed against the marginal costs of raising taxes. Alternatively, if the marginal tax rate is especially high, then both the excess burden and the marginal cost of public funds may be larger because generally the distortions created by taxation increase quadratically with the tax rate. One way rentals for a 26 foot U-Haul between Saint Paul, MN and Naples, FL. Hat tip: Mark Perry. One way rentals for a 26 foot U-Haul between Saint Paul, MN and Austin, TX. Perhaps there is a way to use an internet bot to create a panel of U-Haul prices over time to better understand migration? In 2009, the Minnesota Governor’s 21st Century Tax Reform Commission appointed by Governor Tim Pawlenty released its report. Redesigns of the Minnesota Department of Revenue website keep changing the link to access this report. I am posting the report of the Minnesota Governor’s 21st Century Tax Reform Commission and a brief summary of its recommendations on this blog so that it may be more easily accessed and read.